BPW Doutta Galla was formed in 1960 and celebrated its 50th anniversary in October 2010. After half a decade of service to women and the community in the north-west of Melbourne, it was time to look resolutely into the future, and in March 2011 Doutta Galla therefore took on a new name: BPW Melbourne North-West. The Club adopted a new Constitution and a new Strategic Action Plan to move into the future with renewed vigour, and has worked hard and successfully to expand membership. BPW Melbourne North-West continues to encourage members to share and expand their knowledge, while also identifying issues that affect women in the wider community and finding practical and positive ways to address them. 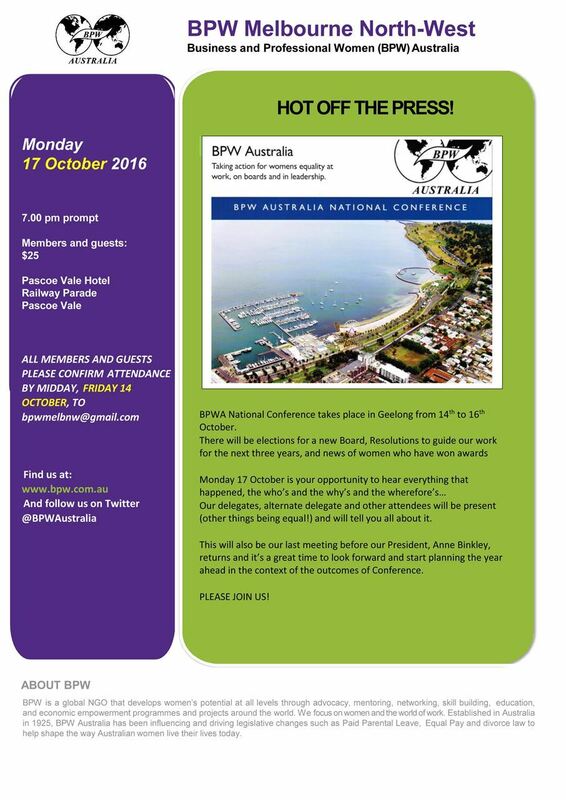 At BPW Australia's national conference in November 2013, BPW Melbourne North-West won both the Award for Best Annual Report and the Award for Highest Membership Growth. Our member Mayase Jere took home the Young BPW Australia Award. 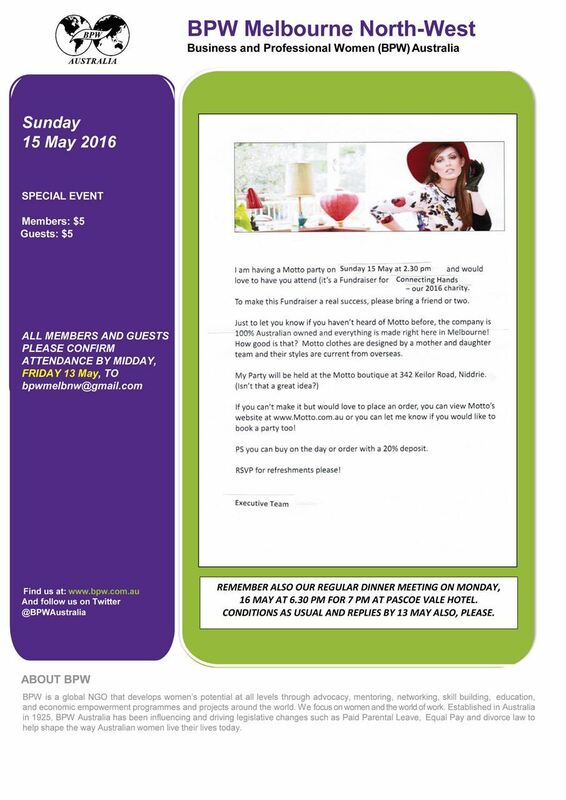 BPW Melbourne North-West is proud to continue supporting the Probus Women’s Housing Project. Over the past 45 years, this project has provided much needed accommodation for women in need. Five members of Melbourne North-West sit on the Probus Committee of Management. 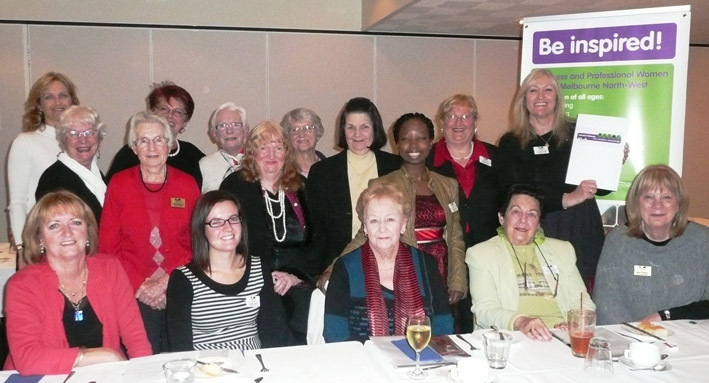 BPW Melbourne North-West members have also been involved at executive level in both BPW Australia and BPW International. We actively encourage guests to join us at our regular dinner meetings and other events and invite you to contact us so that we can put you on our list to receive email updates of our meetings. 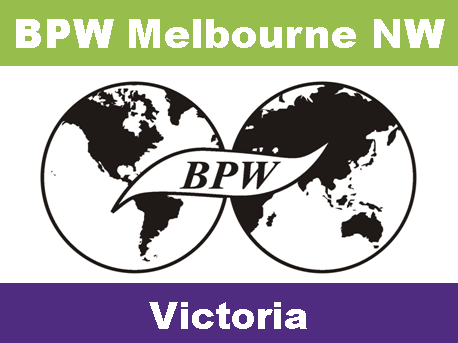 All the members of BPW Melbourne North-West welcome new members and guests to our monthly meetings and to join us in one of BPWA’s oldest clubs. We are a lively club with young and older members, and we have a particular focus on project work in our community and beyond. BPW Melbourne North West is a fabulous group of women passionate about contributi ng to improving the economic and social equity of working women. I have been a member of BPW since 2008 and love the diversity of the BPW membership . Members are from all walks of life, a wide range of profession s, industries , ages and cultural backgrounds. We invite you to come along and get involved, or just come and enjoy our guest speakers, good food and even better company! Feel free to email us at: bpwmelbnw@gmail.com for more information, and to be included on our mailing list for information about forthcoming events. 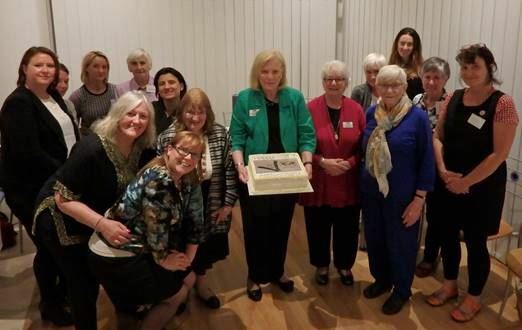 BPW Melbourne North West celebrate the 70th Anniversary of BPW Australia with a birthday cake at their February meeting. BPW Melbourne North-West members came together to design and implement the TRW project, which focused on setting up zones in our area where small business owners and staff had pledged to eliminate workplace violence and harassment and to put in place reporting lines for workers who witnessed inappropriate behaviour from fellow workers, suppliers or customers. The project got a boost when the first workplace to sign on was the office of local MP and Leader of the Labor Party, the Hon. Bill Shorten. 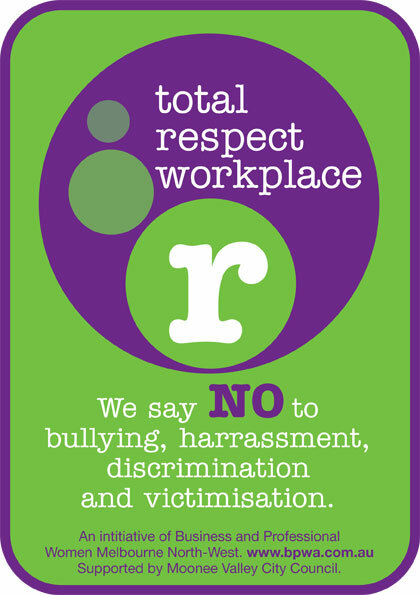 Butchers, bakers, beauty shops, dental offices, dress shops and others followed suit and all display the TRW sticker proudly on their shop windows, raising the awareness of the general public that violence in the workplace is not only a crime in Victoria, it is not to be tolerated. 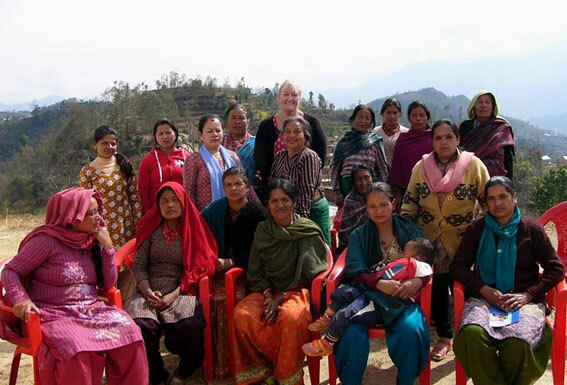 In 2014, our member June Kane AM, former BPW Australia President, travelled on a UN mission to Nepal. There she visited an organization working to improve the status of widows in Nepal. Through religious and cultural tradition, widows in South Asia are often held responsible for their husband’s death. They are cast out of society, made to destroy their jewellery, wear only white and remove the ‘bindi’ mark on their forehead. They are refused employment and often their children are not allowed to go to school. Easily recognizable in their white saris, they are the focus of violence and insults even in their own communities. The organization WHR Nepal has worked to get the status of ‘widow’ recognized in Nepalese law, to have them included in the census, and to abolish the practice of forcing them to wear white. WHR has also built ‘chihhaaris’ or ‘meeting places’ in communities across Nepal where the widows – some of them very young, given the recent civil war that saw many young men killed – come together to grow vegetables, exchange wisdom and support each other. June gave a presentation on her visit to a group of women in a chihhaari in the foothills of the Himalays to BPW Melbourne North-West and to Soroptomists Melbourne, and the two clubs joined to organize a fundraising event with all proceeds going to WHR. More than US$1,000 was raised and has gone towards building a new chihhaari on the outskirts of Kathmandu. 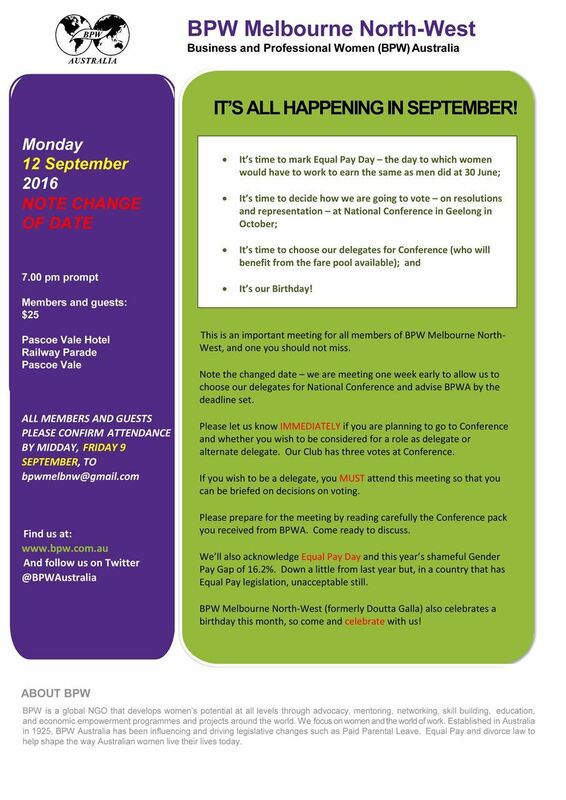 BPW Melbourne North-West put forward to the BPWA Congress in 2010 for work to be done to research and produce a toolkit that clubs could use to learn about, and do work on the problem of sexual violence linked to the abuse of modern technology. A working group was set up to do the research and consult with experts in this area, and to report to club members. The result was a ‘Sexual Violence and Technology Toolkit’ that was launched at BPW Melbourne North-West in an event that also included a roundtable with experts on issues such as ‘sexualization of women in advertising’ and ‘staying safe on-line’. The kit was distributed to all BPWA clubs and forwarded to BPW International.